After several days in the sticks, we drive through a county seat in western Sichuan province. 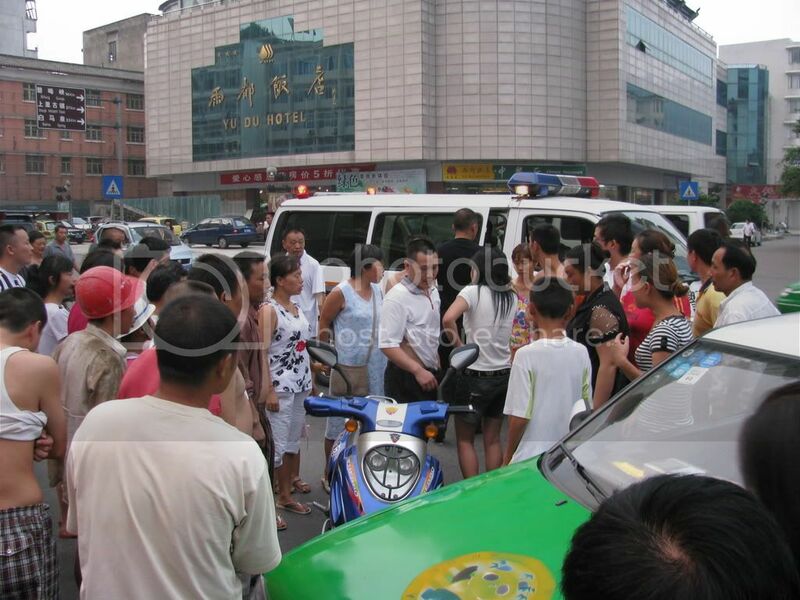 Pass a scene we've come across many many times before -- huge throng of people crowding the street around what appears to be a traffic accident. Scene 2: dramatis personae emerge. 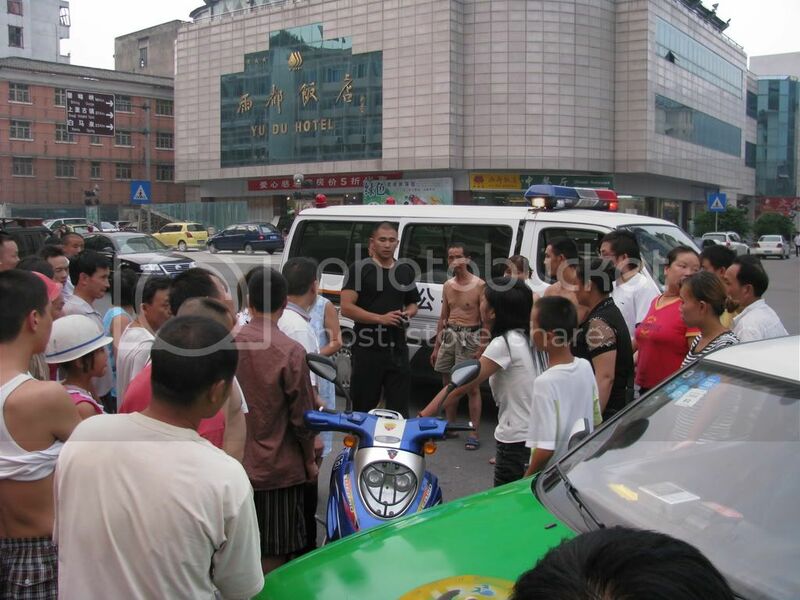 The more-aggrieved party is the young woman on the right in white T-shirt, with arms crossed. (Click for larger shot.) She was riding the blue motorbike, when (apparently) the green taxi make a sudden turn in front of her and she plowed into its side. The taxi driver, partly visible, is the man she is looking daggers at, who is also looking at her. And a white van marked Gong An, "public security," has just rolled up. Scene 3: The authorities take charge. Out of the Gong An van steps a big burly guy in all black, holding a camera. The motorbike woman immediately begins pleading her case to him. Scene 4: The Gong An guy, having taken his pictures, gets into his van and prepares to drive away. 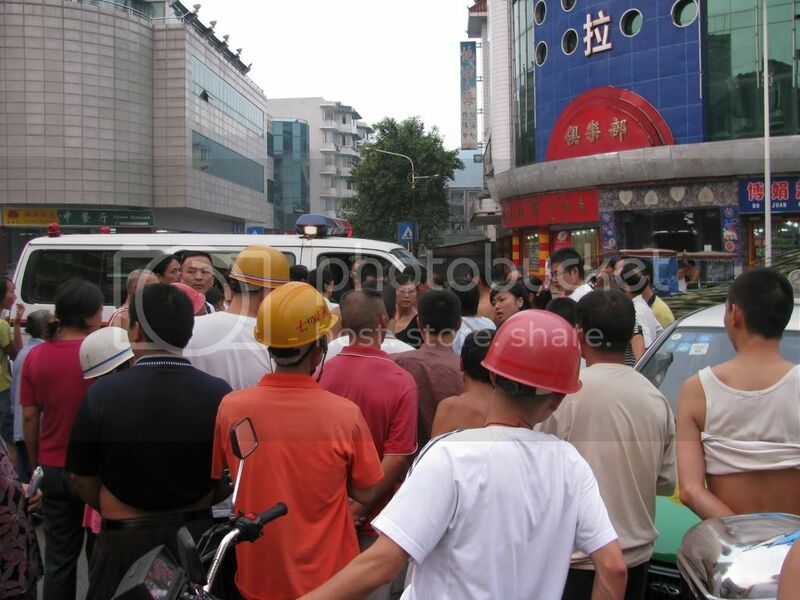 The motorbike woman and the taxi driver man, now next to each other (both in white shirts) yell for a while. The taxi is more badly damaged than the motorbike, with its fender bent in so it almost touches the wheel. Scene 5: the crowd breaks up and everyone starts going away. Taxi driver is center stage in this shot, in the white shirt; the woman is behind him on a mobile phone. The taxi will obviously have to get fixed. The motorbike has a scrape but otherwise looks functional. Fortunately neither party appears to be hurt. 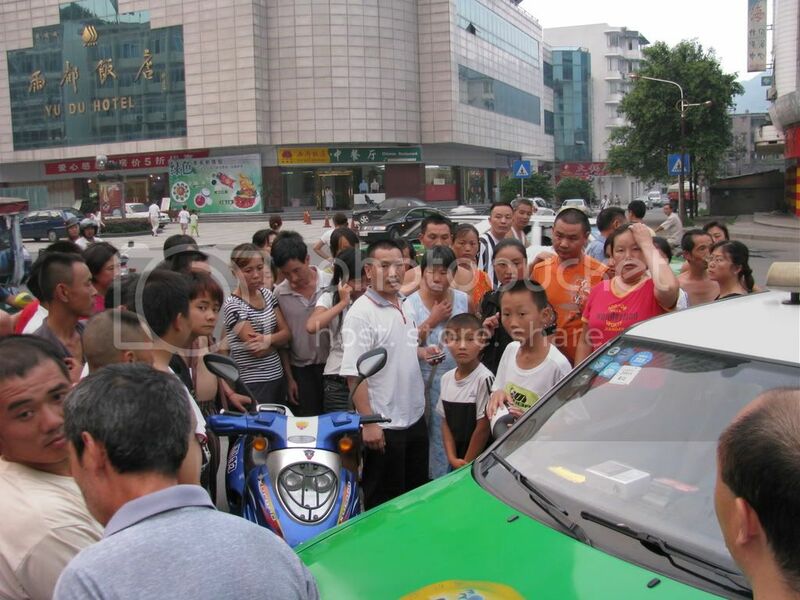 I don't know enough about Chinese traffic-court jurisprudence to be able to say what will happen to whom later on. 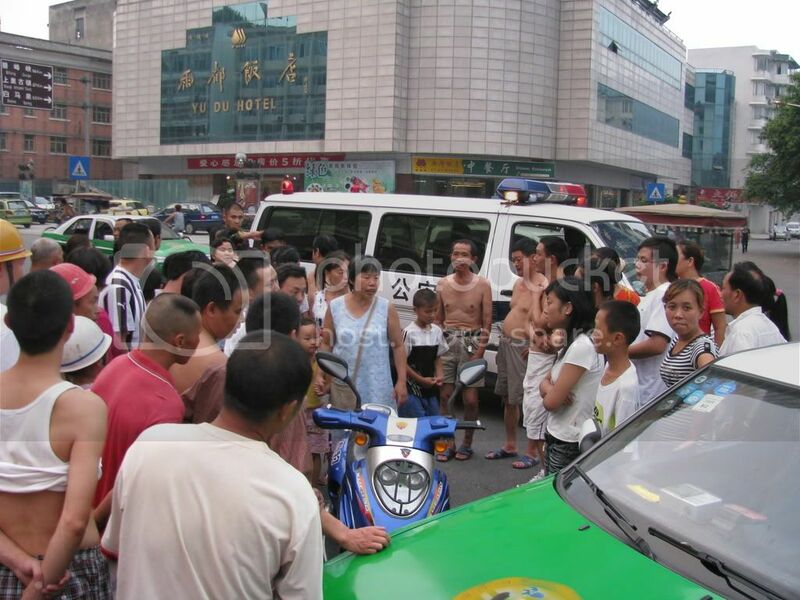 But this kind minor traffic mishap, with attendant crowd scene -- and all parties leaving the vehicles where they are, in the middle of traffic, till the cops arrive -- and then eventual inconclusive drifting-away is familiar enough to be worth one specimen example. Now back to the sticks -- where the traffic-casualty rate is actually much higher than in cities, but that's a different topic..